In 2010, Bernadette Peters' and Mary Tyler Moore's Broadway Barks traveled to Royer Greaves School for the Blind to attend a "pet and play" session with homeless animals and renowned animal rights advocate Bill Smith. Happy dogs walked through a maze of wheelchairs and nuzzled the students' hands. Puppies sat on the children's laps, and the older residents of the school laughed aloud as they ran their hands over the dogs' faces and ears. During that visit, Broadway Barks witnessed the amazing healing and restorative effect that companion animals can have on the lives of children with visual impairment and other disabilities, and how important the bond is for both humans and animals. Broadway Barks decided then and there to create Braille Barks and convert books celebrating the bond between children and animals into Braille so children attending schools for the blind all over the country could enjoy, and be inspired by, the same books sighted children have cherished for years. Since the program's inception, Bernadette Peters, Broadway Barks' volunteer Charlene Sloan, and Bill Smith have converted thousands of children's books about animals into braille and distributed them to schools for the blind and lending libraries throughout the country. For generations, writers of children’s books have used animals as the central characters of their stories in order to inspire and motivate their young readers. 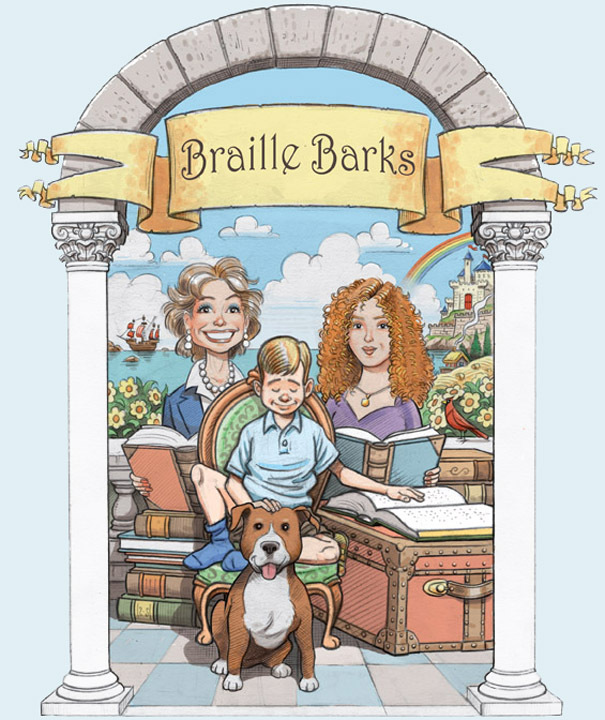 Braille Barks hopes to inspire visually impaired children with these same stories and at the same time promote the humane treatment of animals, encourage adoption of shelter pets, and celebrate the special friendships between children and animals. Books in the Braille Barks Book Club encourage teamwork and trust, and respect for all living things. The characters overcome obstacles and learn to love themselves for who they really are. Perhaps most important, our stories teach the reader they are not alone. That life has infinite possibilities. And whether you’re a child with a disability or a homeless shelter pet, we all need help from time to time to realize our full potential. The National Federation for the Blind confirms the illiteracy rate among blind children is at an astounding ninety percent, explaining that Braille books are often too expensive for many students. Braille Barks books are provided to schools for the blind free of charge. Books selected for the Braille Barks project are transcribed and checked for accuracy by accredited Braille transcribers. The Braille text is then printed onto clear plastic panels that are affixed to the book pages with a strong permanent adhesive. The clear Braille labels provide accessibility to the blind reader, while allowing the book’s text and illustrations to remain visible for sighted readers.